"It is a truth universally acknowledged that a zombie in possession of brains must be in want of more brains." So begins Pride and Prejudice and Zombies, an expanded edition of the beloved Jane Austen novel featuring all-new scenes of bone-crunching zombie mayhem. As our story opens, a mysterious plague has fallen upon the quiet English village of Meryton—& the dead are returning to life! Feisty heroine Elizabeth Bennet is determined to wipe out the zombie menace, but she's soon distracted by the arrival of the haughty & arrogant Mr. Darcy. What ensues is a delightful comedy of manners with plenty of civilized sparring between the two young lovers—& even more violent sparring on the blood-soaked battlefield as Elizabeth wages war against hordes of flesh-eating undead. Can she vanquish the spawn of Satan? And overcome the social prejudices of the class-conscious landed gentry? Complete with romance, heartbreak, swordfights, cannibalism & thousands of rotting corpses, Pride and Prejudice and Zombies transforms a masterpiece of world literature into something you'd actually want to read. This is my honest review. Zombie slayers Mr. Darcy and Elizabeth Bennett make a dynamic duo! Let me begin by saying that I’m not a self-proclaimed Austenite or anything, but I adore Jane Austen’s Pride and Prejudice so much that I own a few copies in my collection and two versions of the audiobook for my listening pleasure. I’m also one to appreciate all the versions of the Pride and Prejudice movies. I also don’t read very many stories that include zombies…just not very interested. 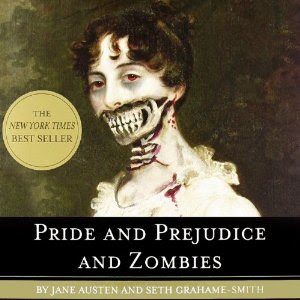 When I first started seeing Seth Grahame-Smith’s Pride and Prejudice and Zombies in stores a few years ago, I thought it was weird. I might have overlooked it at the time because I was still uninterested in reading anything with zombies. Now, after reading and enjoying a few modern day Pride and Prejudice retellings, I decided to try Pride and Prejudice and Zombies on a whim in audiobook form. You know what? I found it to be delightfully humorous and a pleasurable listen! If you’ve read or watched Pride and Prejudice before, then you know the story. I won’t rehash what the story is about. This one has a healthy dose of zombie twist, which I found horrifyingly good! The Bennett daughters are students of the Shaolin Arts, so they are very capable when they run into zombies. I love that there is a katana-wielding Elizabeth Bennett and Mr. Darcy as they are both zombie slayers. I only wish there were more detailed scenes with the two of them fighting off the zombies together as they make a dynamic duo. Nevertheless, I found myself looking forward to certain, memorable scenes just because I wanted to see how the author would incorporate zombies into the mix. Several scenes were very amusing. I’m so glad I finally gave this book a try! Love it or hate it, take this book for what it is…an entertaining retelling of a classic and beloved novel. It’s always nice when the book and narrator is a great match. Katherine Kellgren narrating Pride and Prejudice and Zombies is an awesome pairing! I had to laugh-out-loud when Charlotte Lucas was speaking, and I never even found her character that appealing before. Kellgren did contribute to making Elizabeth Bennett more fierce and lively and Mr. Darcy as dashing even with all the zombie slaying and violence. She made my listening experience very engaging! I enjoyed so much that as soon as I finished it the first time, I went back to listen again immediately. What other Pride and Prejudice retellings do you like? This blog is recommended for those 18 years old or older. Share book reviews and ratings with GraceMyBookSnack, and even join a book club on Goodreads. Disclosure in accordance with FTC Guidelines 16 CFR Part 255 The books I review on this blog are either purchased by me or borrowed from the library. I do accept and receive published books or advanced review copies from publishing companies, book promotion companies and authors for review purposes only. I am not paid for any promotions. I do not sell the books that I receive for free. I am not paid money or compensated for my opinions. I do not earn money through my blog. The reviews I post are of my own honest opinion. I wish this blog to be drama free. Please respect the opinions of those commenting. Thank you!